Officially known as the Union Flag, the flag of the United Kingdom is popularly known as the Union Jack. The full name of the United Kingdom is United Kingdom of Great Britain and Northern Ireland. Great Britain consists of England, Scotland and Wales. United Kingdom is simply referred to as UK in common parlance.Wales is not currently represented in the flag of United Kingdom because it was part of England when the first version of the flag was designed. The national flag of the United Kingdom is also known as the Union Jack. Some member counties of the Commonwealth also use the British flag in the corner of their flags. When the first flag was created in 1606, it was known simply as ‘the flag of Britain’ or ‘the British flag’. Designed over 200 years ago, the flag of the United Kingdom that we know today dates from 1801, the year in which Ireland was united with Britain. However, before 1603, the Union Jack was very different than today’s flag. England, Scotland and Ireland were separate nations, each of them having their own individual flags. The Union Jack, one of the world’s most recognizable flags, combines the symbols of England’s patron saint St. George (red cross on a white background), Scotland’s patron saint St. Andrew (diagonal white on blue) and Ireland’s patron saint Saint Patrick (diagonal red cross on white). Wales is not shown on the flag of the United Kingdom because, when the first version of the flag was created in 1606, Wales was part of England. The original flag of United Kingdom was much larger in size than those of the US flag and the flags of many other countries. The Union flag has undergone many changes since the first official flag of 1606.After the death of Queen Elizabeth I of England in 1603, King James VI of Scotland became ruler of England and came to be known as King James I of England. Since Queen Elizabeth was unmarried, she wanted King James VI, her cousin to succeed her. In order to represent the union between these two countries, King James I, hit upon the idea of commissioning a new flag in 1606. The first version of the British flag came into being in 1606. When Ireland became a part of Great Britain in 1801, the British Flag was redesigned to include the Cross of St. Patrick, the patron saint of Ireland. It is in this form that the British flag that we know today exists. In 1921, when Ireland gained independence from United Kingdom, the cross representing Ireland continued to remain on the flag because Northern Ireland was a part of Britain at that time. When is the Union Jack flown? The flag should be displayed on government buildings on days marking Remembrance Day, Coronation Day, Commonwealth Day, official birthday of the Queen and on the days of the prorogation of Parliament and State Opening. Declan, Tobin. " 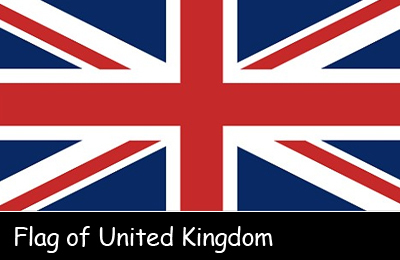 Union Jack Flag facts for kids - ." Easy Science for Kids, Apr 2019. Web. 26 Apr 2019. < https://easyscienceforkids.com/union-jack/ >.